Innovations has led to smart assistive devices, integrating both software and hardware components, are transforming the rehabilitative regimes of many mainland patients with variety of rehabilitation equipment, ranging from large medical devices to small household items. Wider application of artificial intelligence, brain-computer interfaces, virtual reality and other cutting-edge technologies within the rehabilitative sector are the key element of the large investments in rehabilitation sector. One company in particularly bullish form was Shenzhen Children Laugh Recreation Equipment, a specialist in the autism and cerebral palsy sectors and its equipment can help children suffering from such conditions with their vestibular balance, while also assisting in the development of their visual and auditory senses. Goldstein Research analyst forecast the rehabilitation device market size is set to reach USD 16.5 billion by 2025, at a CAGR of 10% over the forecast years. Intelligent rehabilitation equipments are officially endorsed by many hospitals and rehabilitation institutions, as well as by consumers themselves, are adding confidence to the rehabilitation device market. The report covers the present ground scenario and the future growth prospects of the rehabilitation device market for 2017-2025 along with the data of installed units in medical facilities and rehab centers worldwide. We calculated the market size and revenue share on the basis of revenue generated from major players across the globe. The rehabilitation device market is forecasted on the basis of revenue analysis, product benchmarking and strategic developments of key market players. The report also includes micro and macro factors essential for the existing market players and new entrants along with detailed value chain analysis. Based on product type, mobility equipment dominated the global rehabilitation device market and is projected to generate revenue of USD 6.6 billion by 2025 owing to increase in prevalence of degenerative diseases and number of trauma cases has led to a rise in number of patients in need of rehabilitation. Daily living aids and exercise equipment is growing steadily attributed to increasing number of rehab centers and government awareness programs. While on the basis of end-user, the hospital segment valued at USD 3.76 billion in 2017 and is anticipated to witness high growth over the forecast period. Global Rehabilitation Device Market Outlook 2017-2025, has been prepared based on an in-depth market analysis from industry experts. The report covers the competitive landscape and current position of major players in the global rehabilitation device market. The report also includes porter’s five force model, SWOT analysis, company profiling, business strategies of market players and their business models. Global rehabilitation device market report also recognizes value chain analysis to understand the cost differentiation to provide competitive advantage to the existing and new entry players. 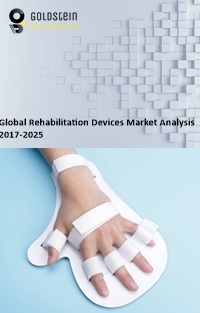 Our global rehabilitation device market report comprises of the following companies as the key players: Invacare Corporation; Medline Industries, Inc.; Dynatronics Corporation; Drive Devilbiss Healthcare; Esko Bionics; Caremax Rehabilitation Equipment Ltd.; GF Health Products, Inc.; Hospital Equipment Mfg. Co.; Maddak, Inc., India Medico Instruments. According to the report, major driving factor is the portability of the devices coupled with the technology as the smaller size of the advanced rehabilitation devices also brings down costs by eliminating concerns with storage, portability, and weight, for instance, Neofect’s flagship product is the Rapael Smart Glove, a flexible robotic glove fitted with sensors to capture the patient’s motion and measure the degree of finger and wrist movement. While one of the South Korean tech startup has set out to start with a series of smart home rehabilitation products which uses a meticulously designed biofeedback gaming system to motivate and empower recovering patients throughout their rehab programs. Further, the report states the biggest challenge is the cost ineffectiveness of the rehabilitation device market as rehabilitation machines are inherently large and require a permanent or semi-permanent set-up and the facility able to house such a device along with the personnel required for operating them is at a large economic disadvantage. Based on geography, North America (37%) and Europe (35%) accounted for the largest share in 2017, whereas, the Asia Pacific market is expected to grow at a CAGR 10.12% between 2017 and 2025 owing to the increasing incidences of rehabilitation cases. Device portability, cost, real-time abilities and versatility are the key potentials for the market. China, Indonesia, Singapore, Saudi Arabia, Australia, Korea and Taiwan are the opportunistic market due to the large investments in the medical devices updation and regulations. Subsidies and reimbursement programs are few factors anticipated to promote growth in Latin America and Middle East & Africa.